Williamsburg’s new city center; an experience-based retail, entertainment, and residential district. Midtown Row, located at “Main and Main” in the heart of Williamsburg, Virginia, is a curated retail experience and residential district. It includes restaurants, shops, apartments, entertainment, office space, as well as a village green featuring outdoor programming and community event space. Adjacent to the historic campus of the College of William & Mary, less than a mile from Colonial Williamsburg, and less than 5 miles to other top tourist destinations like Jamestown, Yorktown, Busch Gardens and Water Country USA, Midtown Row is perfectly positioned to capture the interest of a growing population and the area’s more than six million annual visitors. As the new urban center of Williamsburg, Midtown Row has been designed to be a pedestrian and cycling friendly community. Retail Space — 233,047 SF total, including 56,243 SF of new retail and 176,804 SF of revitalized retail. Residential — brand new accommodations for up to 628 residents. Office Space — 6,319 SF premium office space. Streetscape Improvements — proudly partnered with the City of Williamsburg to develop a $3 million streetscape. Residents and visitors can enjoy Midtown Row’s close proximity to Williamsburg’s numerous historic and recreational destinations. It is also within walking distance of the College of William & Mary’s student population of 8,700. 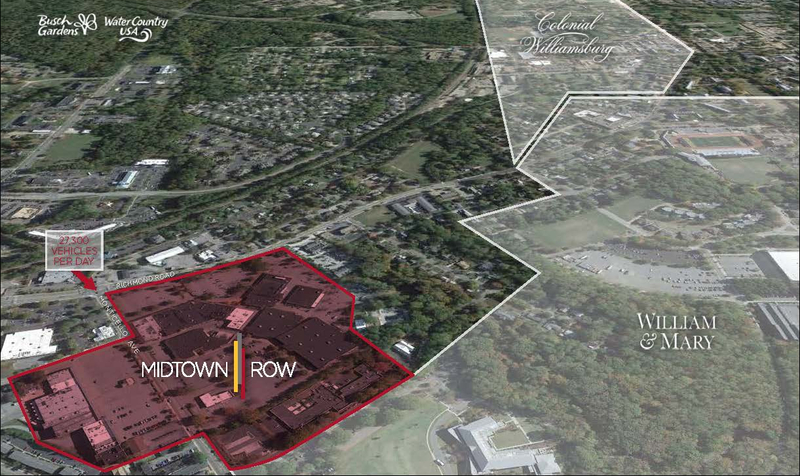 Note: The Midtown Row site includes the former Williamsburg and Monticello Shopping Centers.